Success requires treating the underlying disorder, inflammation, and elevated IOP. A 70-year-old woman was referred to our office as a glaucoma suspect in the setting of recurrent herpes simplex virus (HSV) epithelial and stromal keratitis of the right eye. The patient had no history of associated uveitis. Primary angle closure was suspected, and she underwent bilateral laser peripheral iridotomies (LPIs). Her medications at presentation included latanoprost at bedtime, a fixed combination of dorzolamide and timolol twice daily, brimonidine twice daily, trifluridine of varying frequency, frequent loteprednol tapers for intermittent corneal stromal involvement, and oral acyclovir 800 mg three times daily. Although the LPIs succeeded in opening the angles, IOP remained in the mid-20s in the right eye. Optical coherence tomography of the retinal nerve fiber layer showed thinning of the right optic nerve compared to the left, with a corresponding nasal step on the visual field. Because the patient was overwhelmed by the drop regimen and we were concerned about corneal toxicity, we performed selective laser trabeculoplasty (SLT) in an attempt to reduce the medication burden. Unfortunately, the IOP remained unchanged. Subsequently, the patient underwent trabeculectomy with mitomycin C in the right eye. Approximately 6 months postoperatively, she underwent a full-thickness corneal transplant in the same eye. Ten years later, she maintains a BCVA of 20/40 and an IOP in the upper teens on no glaucoma drops in the right eye. She continues to use loteprednol etabonate ophthalmic ointment 0.5% (Lotemax; Bausch + Lomb) once daily for rejection prophylaxis and takes oral acyclovir 400 mg twice daily to reduce the risk of recurrent HSV. This case illustrates the complexity of glaucoma management in the setting of herpetic eye disease. 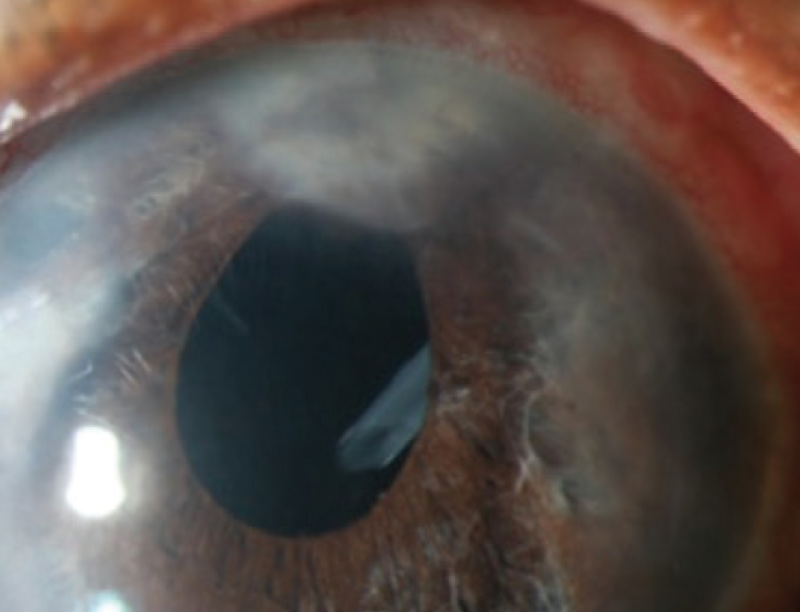 There were multiple reasons for the patient to have elevated IOP, including occludable angles with subsequent open-angle glaucoma after LPI, secondary open-angle glaucoma from chronic steroid use, and trabeculitis from herpetic eye disease. Because this patient had no prior episodes of uveitis, we felt safe performing SLT. 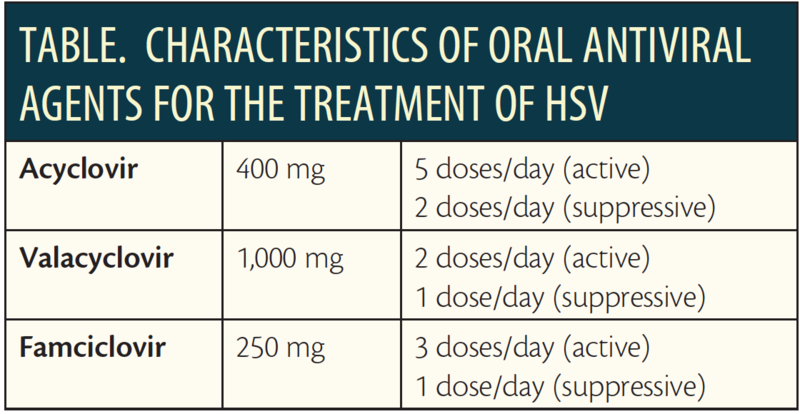 Whether the procedure was ineffective because of possible underlying HSV is unclear. Regardless, the next step was more invasive glaucoma surgery. • Herpes simplex and herpes zoster are the two most common herpes viruses associated with elevated IOP and uveitis. 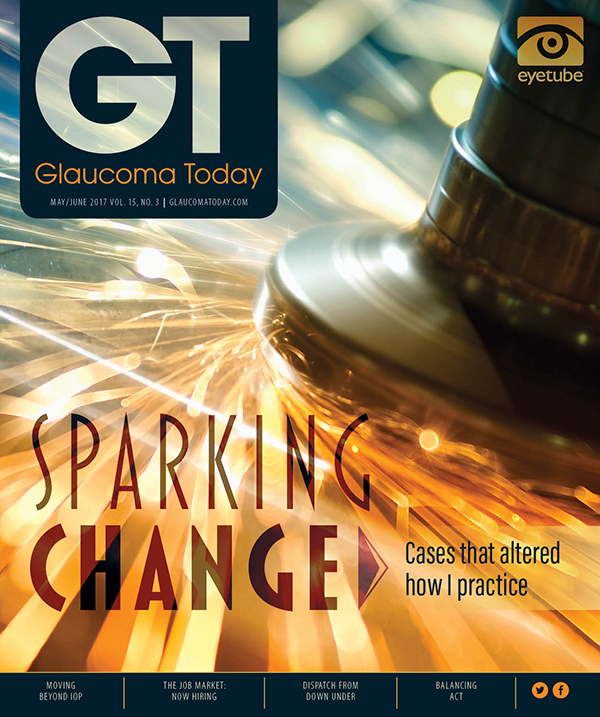 • Glaucoma management in the setting of herpetic eye disease depends on several factors: treating the underlying disorder, treating inflammation, and treating the elevated IOP. • In most cases, suppressive antiviral and anti-inflammatory medications, along with topical IOP-lowering drops, are successful for managing these patients. In recalcitrant cases, surgical intervention may be warranted. Figure 1. One possible mechanism for IOP elevation in herpetic anterior uveitis. Reprinted from Choi JA et al.3 Creative Commons Attribution 4.0 International License: creativecommons.org/licenses/by/4.0. Figure 2. Sulcus placement of a glaucoma drainage device in a patient with glaucoma secondary to uveitis. Topical corticosteroids, cycloplegics, IOP-lowering drops, and surgery may also be needed, and it is crucial to treat inflammation adequately to reduce the risk of long-term damage to the trabecular meshwork. A common mistake is to undertreat inflammation for fear of a steroid-induced elevation of IOP, but steroid dosage and frequency do require close monitoring. Microinvasive glaucoma surgery may one day prove beneficial for uveitic patients, given that these procedures reduce ocular tissue trauma. More long-term studies are needed to confirm their efficacy. Glaucoma and OHT may be associated with herpetic eye disease. In most cases, suppressive antiviral and anti-inflammatory medications, along with topical IOP-lowering drops, are successful for managing these patients. In recalcitrant cases, surgical intervention may be warranted. 1. Sungur GK, Hazirolan D, Yalvac IS, et al. Incidence and prognosis of ocular hypertension secondary to viral uveitis. Int Ophthalmol. 2010;30(2):191-194. 2. Shimizu A, Maruyama K, Yokoyama Y, et al. Characteristics of uveitic glaucoma and evaluation of its surgical treatment. Clin Ophthalmol. 2014;8:2383-2389. 3. Choi JA, Kim JE, Noh SJ, et al. 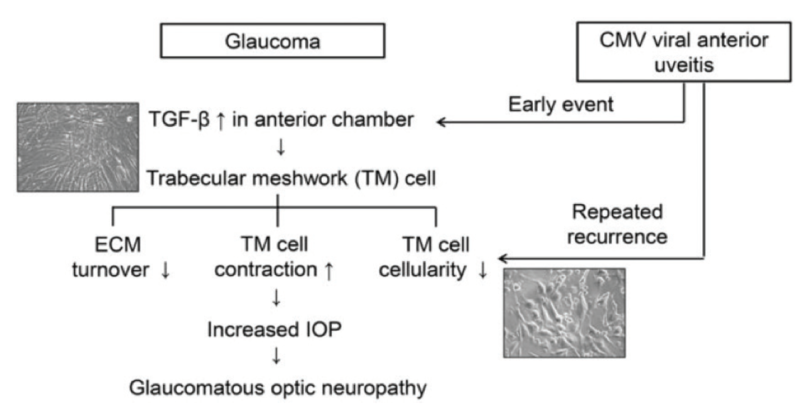 Enhanced cytomegalovirus infection in human trabecular meshwork cells and its implication in glaucoma pathogenesis. Sci Rep. 2017;7:43349. 4. Nagpal AG, Acharya NR. Uveitic glaucoma. In: Grehn F, Stamper R, eds. Glaucoma. Heidelberg, Germany: Springer; 2009:50-57. 5. Sudesh S, Laibson PR. The impact of the herpetic eye disease studies on the management of herpes simplex virus ocular infections. Curr Opin Ophthalmol. 1999;10(4):230-233. 6. A controlled trial of oral acyclovir for the prevention of stromal keratitis or iritis in patients with herpes simplex virus epithelial keratitis. The Epithelial Keratitis Trial. The Herpetic Eye Disease Study Group. Arch Ophthalmol. 1997;115(6):703-712. 7. Muñoz-Negrete FJ, Moreno-Montañés H, Hernández-Martínez P, Rebolleda G. Current approach in the diagnosis and management of uveitic glaucoma. Biomed Res Int. 2015;2015:742792. 8. Markomichelakis NN, Kostakou A, Halkiadakis I, et al. Efficacy and safety of latanoprost in eyes with uveitic glaucoma. Graefes Arch Clin Exp Ophthalmol. 2009;247(6):775-780. 9. Rubin B, Taglienti A, Rothman RF, et al. The effect of selective laser trabeculoplasty on intraocular pressure in patients with intravitreal steroid-induced elevated intraocular pressure. J Glaucoma. 2008;17(4):287-292. 10. Wang S, Gao X, Qian N. The Ahmed shunt versus the Baerveldt shunt for refractory glaucoma: a meta-analysis. BMC Ophthalmol. 2016;16:83. 11. Iverson SM, Bhardwaj N, Shi W, et al. Surgical outcomes of inflammatory glaucoma: a comparison of trabeculectomy and glaucoma-drainage-device implantation. Jpn J Ophthalmol. 2015;59(3):179-186.